Ok, so this week’s photo challenge word prompt is ‘van’. I’m assuming you don’t want to see a random work’s van parked at the side of a road so I have taken a touch of artistic licence with this one… does this count? 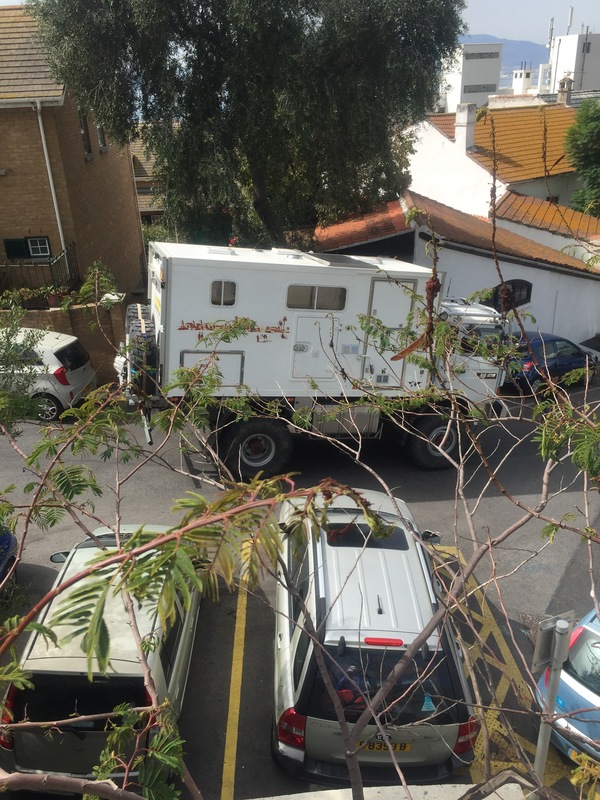 This van/truck/camper contraption got stuck trying to get down one of the narrow residential roads in South District last year. We see lots of motor homes chugging up the hill on the way to Europa Point, presumably because their occupants want to get to the southernmost tip of Gibraltar on their holiday road trip. One Sunday afternoon, the main road to Europa Point was closed to allow for a crane to be erected on a nearby building site and the northward diversion route was to head down this narrow road (which has parked cars all down one side). I watched through my fingers as a few passers-by waved and gesticulated like mad to guide the unfortunate driver as he reversed uphill and round a bend while missing parked motorbikes and wing mirrors along the way! 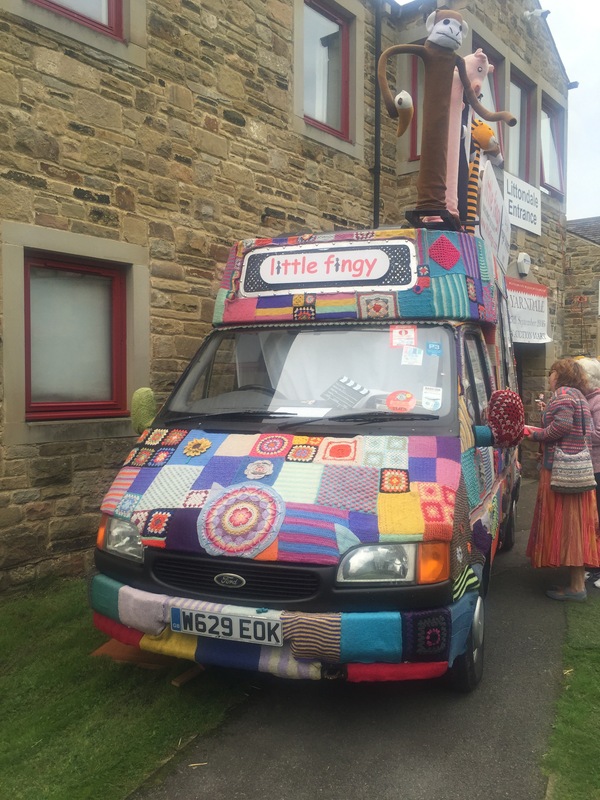 What about a yarnbombed ice cream van? This beauty was parked up outside the Skipton Auction Mart at last year’s wonderful Yarndale Festival. Instead of ice creams being sold from it’s window customers were buying knitted finger puppets. The company, Little Fingy sources it’s hand knitted puppets from villagers in the Andes in South America and raises money to support their communities. Now for more artistic licence… how about ‘bus’ instead of ‘van’? 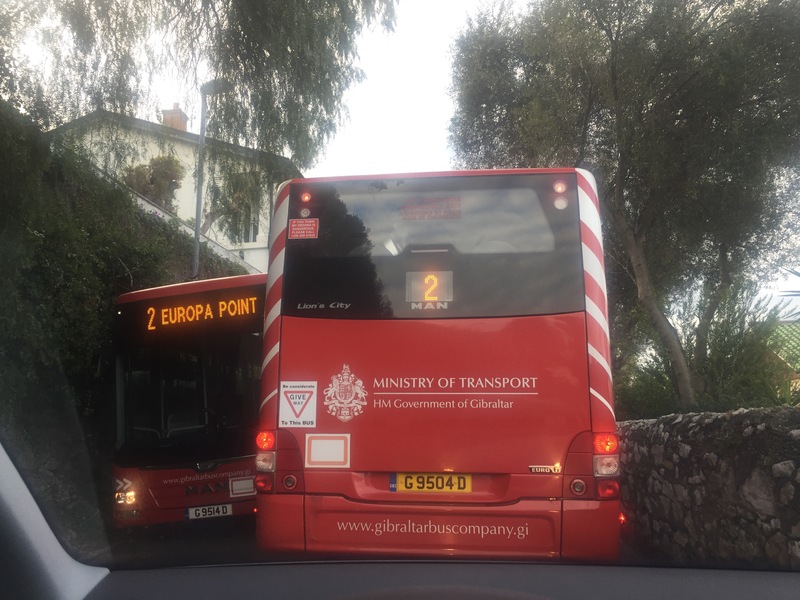 I wouldn’t want to be a bus driver in Gibraltar. I got stuck behind these two buses on a particularly narrow stretch of road one day. How they both got through without hitting each other or the walls either side of the road, I have no idea. Hats off the drivers for their amazing driving skills. I’m linking with Wild Daffodil and Nana Cathy for this weekly photo challenge throughout 2017. Great Van photos, lovely glimpses of Gibraltar ! I adore the yarn bombed one! that was a great achievement I am sure you don’t see those often! Absolutely- I can’t imagine how long it took to crochet that huge yarnbomb!!! Great selection of photos – adore Little Fingy! Was it actually covered with yarn – I wonder how they keep it clean – I’d love to cover my car like that! It’s wonderful isn’t it? It was totally covered with crochet. I guess you would need to have it made in easily removable panels… and a large washing machine! Yarnbombed van wins hands down! How fab!!!! Love the ice cream van! I also used the yarny van for my weekly photo! And those buses, eeeeek, how do they manage it?! Great minds think alike!! (Well, not sure how great mine is?!) I know the bus drivers are just amazing! You really make it appear so easy with your presentation but I to find this matter to be really one thing that I feel I’d by no means understand. It seems too complicated and extremely extensive for me. I am taking a look forward to your next publish, I will try to get the grasp of it!